Electric tapes are used to measure groundwater levels and to verify the accuracy of pressure transducers installed in wells. Electric tapes are generally assumed to be accurate to ±0.01 foot (ft), but little information is available from the manufacturers and no accuracy studies have been conducted to confirm this value. This study measured the accuracy of six popular models of electric groundwater tapes. The tapes tested include models from Durham Geo, Geotech, Heron, In-Situ, Solinst, and Waterline that are commonly used by the U.S.Geological Survey (USGS). The accuracy tests compared the length of each electric tape to a calibrated-steel reference tape and measured each probe’s activation accuracy and displacement volume. The tape-length accuracy combined with the probe-activation accuracy gave the overall measurement accuracy of the tape. The accuracy tests demonstrated that none of the electric-tape models tested consistently met the suggested USGS accuracy of ±0.01 ft. The test data show that the tape models in the study should give a water-level measurement that is accurate to roughly ±0.05 ft per 100 ft without additional calibration. To meet USGS accuracy guidelines, the electric-tape models tested will need to be individually calibrated. Specific conductance also plays a part in tape accuracy. The probes will not work in water with specific conductance values near zero, and the accuracy of one probe was unreliable in very high conductivity water (10,000 microsiemens per centimeter). 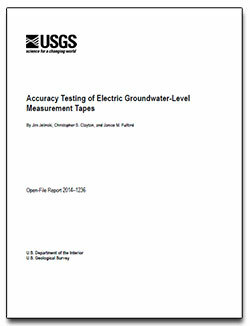 Jelinski, Jim, Clayton, C.S., and Fulford, J.M., 2015, Accuracy testing of electric groundwater-level measurement tapes: U.S. Geological Survey Open-File Report 2014–1236, 27 p., https://dx.doi.org/10.3133/ofr20141236.